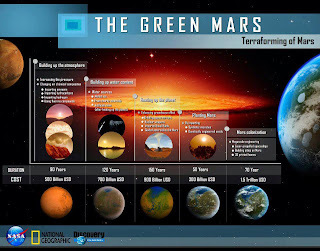 Terraforming is the process of turning a terrestrial body to an environment more suitable for human habitation. There are three planets in our own solar system that commonly mentioned targets of this process in order of increasing viability: Jupiter's frozen moon Europa, Venus, and, of course, Mars. A considerable amount of research has gone into whether or not terraforming is achievable or practical. One can also easily find debates on whether or not terraforming is morally or ethically supportable. A significant portion of the Mars Trilogy by Kim Stanley Robinson revolves around just that question. Moholes, genetically engineered lichens and deliberate meteoroid strikes are all described as techniques to add a few more millibars of atmospheric pressure, a few more degrees of heat to a cold, dead wasteland. I'm less sure of the thought given to what terraforming means in literature such as Red Mars. When an author or director or screen-writer includes terraforming within a story, what is the message? Well, certainly there are plenty of examples of terraforming mentioned in popular culture that are more or less just that: references. When terraforming is mentioned in a Sy Fy movie or Aliens, it functions on an essentially practical level of a certain type of speculative fiction. In order to walk around an alien planet, something needs to have happened to the atmosphere and temperature to allow them to move around free of a pressure suit. That something is terraforming. The significance ends there. But not all literature lets terraforming so quickly off the hook. Ursula Le Guin suggests parallels with colonialism and imperialism in her work. And Robinson portrays an exhaustive debate on the topic in his trilogy. The basic question: when we seek to make another planet Earth, what does that say about us? As a quick sketch I would offer three interpretations for the significance of terraforming the Mars Trilogy. 1) Terraforming is really about the environment and more specifically what we are doing to the environment currently. 2) Terraforming is personal growth on the individual level writ large. 3) Terraforming is a metaphor for societal progress generally. I'll take each in order. First off, there's the notion that when we talk about terraforming what we're really doing is talking about Earth. I feel that any discussion of terraforming is really a metaphor for the kinds of ecological changes going on in our own planet currently. We are in a sense de-terraforming Earth right now. By injecting vast amounts of paleozooic carbon dioxide into our atmosphere, it might be said we are making our atmosphere just a bit more like Venus'. In classic speculative fiction transference, authors use terraforming to place our own contemporary actions in relief. Another consideration is terraforming as an allegory of redemption on a personal level. The change of Mars in Red Mars certainly reflects, to a certain extent, the development of characters in the narrative. As Mars warms up, the tensions, conflicts and open conflict of the characters also increased. Heat added to a system also increases entropy. Ultimately a Mars slightly more suitable for human colonization is a Mars more suitable for human war. But on top of that, Red Mars describes an entire menagerie of exotic genetically engineered lichens and algae introduced onto the surface of Mars with the intention of building up bio mass. This serves the interests of Saxifrage Russell in his quest to terraform Mars by any means necessary but it also ties into another theme of the book which is unexpected change. Robinson views Mars, on the sociological level, as a place of tremendous change for culture in general. One of the heroes of the novel is John Boone, the First Man on Mars, who preaches a view of Mars separated from the old evils of Earth. Free to strike off in new directions. The mutated life that creeps across the deep hidden canyons of Mars supports this idea. Change in human society happens at an inexorable but barely perceptible rate. A related idea is that terraforming is in self a symbol of reform and progress. A Hegelian would certainly embrace the philosophy of terraforming as it introduces a practical, tangible theology to human effort. Where it is a good thing or bad thing to impose an Earth like ecosystem on another planet it is certainly a process with a definite outcome spanning decades, perhaps centuries. This is the definition of progress. Successful terraforming's largest effect might not, when all is said and done, be the creation of a new home for the human species. A more durable change would be as an example of positive change over reality through conscious concerted effort. Any effort to terraform Mars would cost trillions upon trillions of dollars and take anywhere from 200 to 10,000 years. In practical terms terraforming is not going to happen anytime soon, certainly not in any of our (normal) lifespans. There are aspects of Robinson's Mars Trilogy that are clearly meant as a thought experiment on how might the human colonization of the Red Planet proceed. What is clear to me having read Red Mars is that terraforming happens in the story for reasons beyond simple narrative convenience. Terraforming in speculative fiction might have more to say about changing us than it does about other worlds.